Hello Again Fab Free’rs. So I’m notoriously late getting my Christmas greeting cards in the mail. I never know what to say and I can never find my address book! This year I kept it simple and sent out a cute photo with “Merry Christmas” scrawled across the bottom. I still had to ask everyone for their address, but next year I’ll be prepared! This cute “Happy Holidays” pose by CNZ reminded me of my Christmas card, and inspired the above look. In this post I’ll tell you how to get the pose, the fancy hair, and this sweet holiday themed dress for FREE. As I mentioned this FREE group gift pose from CNZ inspired the look for this post. I love the chalk scrawl, and Happy Holidays is an appropriate greeting no matter which winter holiday you might be celebrating. You’ll need to join the CNZ group, which is FREE to join at this time. The gift comes with the chalk slate, and 2 versions of the static pose. Also, the vendor will require you to pay one linden and it will then send your gift and return your linden. These pretty curls are the most recent group gift hairstyle at Lovey Dovey. This time of year is just right for long spiral curls, I think they would look so pretty with all the festive holiday outfits. The gift includes the hairstyle in 2 sizes, and a fatpack of 6 color huds. The Lovey Dovey group is currently 100 linden to join, and there are 4 group gifts available. I just love the vintage look of this FREE cute holiday dress by Luziefee. The dress is slightly fitted, mid-calf length with long cuffed bell sleeves. It also happens to be the most recent Fabulously Free in SL group gift at Luziefee. The Fab Free group is always FREE to join. Just wear your Fab Free group tag and click the gift vendor. The dress comes in standard mesh sizes and has an alpha layer. Categories: dress, FabFree Group Gifts, Free, group gifts, groups, hair, mesh, other, poses | Tags: $0L, 0 linden, Alpha Layer, bento pose, Catwa, Catwa Koura, christmas, Christmas Dress, Classic Avatars, CNZ, CNZ Group Gift Pose, Essences, Essences @Kustom 9, Essences Cinnamon, fab free, Fab Free Group Gift Luziefee, fabfree, fabulously free in SL, Fashion in SL, female fashion, free, free bento pose, Free Clothes in SL, free fashion, Free Group Gifts, Free Hair, free in sl, free pose, group gift hair, Hair in SL, Happy Holidays, Happy Holidays Pose, Holiday Dress, Holiday Fashion, K9, Kustom 9, kustom9, Lovey Dovey, Lovey Dovey Group Gift, Luziefee, Maitreya Lara, Pose with Prop, Prudence Rexroth, Second Life, sl, sl freebie, SL Freebies, standard mesh sizes, Vintage Fashion | Permalink. Hello hello Fab Free’rs! 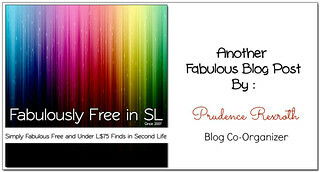 I am again excited to share with you this week’s edition of Fab Free Designer Friday. This post features a women’s clothing and accessories shop called Eloise Baker. I love small quaint shops. Eloise Baker is a small but very charming shop with the look and feel of a boutique clothing store. The shop is self described as “A unique shop with vintage clothing and accessories for women…” I personally could not describe the look and style of this brand better than than that. Most of the items I saw at Eloise Baker looked very feminine and elegant. Even the vintage inspired decor added to the boutique-like atmosphere. As you enter the Eloise Baker shop, you’ll see a small fireplace with a large box in front. This pretty gift box is a FREEBIE at Eloise Baker. There’s no need to join a group for this one, just pay the box zero linden and the gift will be delivered to you. Above the fireplace is where you’ll see some of the usual shop information. As you look through the shop you’ll right away spot the colorful Fab Free group joiner posted above the current FREE Fabulously Free in SL group gift. This adorable floral print dress and the FREE to everyone gift dress has been shown on the blog by Astrid here. As always the Fab Free group is FREE to join if you’re not already a member. Happy shopping Fab Free’rs, enjoy your weekend and this lovely shop! Categories: accessories, dress, FabFree Group Gifts, FF Designer Of The Day, Free, group gifts, groups, mesh | Tags: $0L, 0 linden, boutique, fab free, fabfree, FabFree group gift, fabulously free in SL, fashion, Fashion Freebie, female fashion, free, Free Dresses, free fashion, free gifts, free group gift, free in sl, freebie, gifts, gifts in SL, Second Life, Second Life Freebies, second life gifts, sl, SL Freebies, Vintage Fashion, Virtual Fashion | Permalink.